Another Milestone for Citizen Science! It is always good to have the little flocks of White-throated Sparrows back with us again, tzeeting away to one another as they forage. They are a good reminder of how lucky we are here in Virginia, to be wintering ground for some birds, as well as breeding ground for others (not to mention the ones that pass through in migration), and a reminder that birds need habitat in the winter too – all year round, in fact. Of course we hope our breeding neotropical migrants are able to find good winter habitat in South America and in the Caribbean – and we have that responsibility for the birds that winter with us. And besides, there is that sweet “Sam Peabody” song, that little dab of yellow on the face. Join me in welcoming Louise Edsall as a part time Administrator. In addition to just plain helping us “keep it together,” Louise will be assisting with some of our programs, especially Audubon at Home. Many thanks to Town of Clifton for their donation of $872 – parking proceeds from the Clifton Haunted Trail event at Halloween. And thanks especially to Laura and Regan McDonald for arranging with the town, and to Tom Blackburn and Brenda Frank for volunteering to help direct traffic! Manassas-Bull Run Christmas Bird is Sunday, December 17! If you haven’t signed up yet, it is not too late. Click here. Reminder that our next Audubon Afternoon will be on January 7 – “Post Holiday.” Bob Mumford will be speaking on “Beautiful Bhutan,” with some beautiful photographs. Click here for more information. And a reminder this holiday season that you can designate the Audubon Society of Northern Virginia to receive a portion of the proceeds of purchases you make through Amazon Smile. More information about the program can be found here. The Audubon Society of Northern Virginia is taking applications from public school educators for an all-expenses paid week of professional development plus transportation to National Audubon Society’s Hog Island Camp in Maine. This year’s “Sharing Nature: An Educator’s Week” occurs July 15-20, 2018. Highlights include ospreys, bioluminescent sea creatures, and boat trips to nearby islands, including to a puffin colony. Applicants must be public classroom teachers, specialists, or school administrators working in the cities of Alexandria, Fairfax, Falls Church, Fredericksburg, Manassas, Manassas Park, Leesburg or the counties of Arlington, Fairfax, Loudoun, Prince William or Stafford. Questions? Contact ASNV Youth Education Chair Stacey Evers. Congratulations to Jim Waggener and his group of citizen scientists for another important milestone to preserve and share the tens of thousands of data that has been collected in the Occoquan region count circle. In November, Jim and ASNV, entered into a formal data exchange agreement with Biodiversity Information Serving Our Nation (BISON), an online mapping project managed by the United States Geological Survey. This project seeks to provide open access to primary biodiversity and species occurrence information in the United States. Since 1989, Waggener and a group of dedicated citizen scientists have documented birds, butterflies, dragonflies and first bloom dates of plants in year round surveys. To volunteer or learn more about the natural resource surveys or butterfly and dragonfly surveys visit our web site. 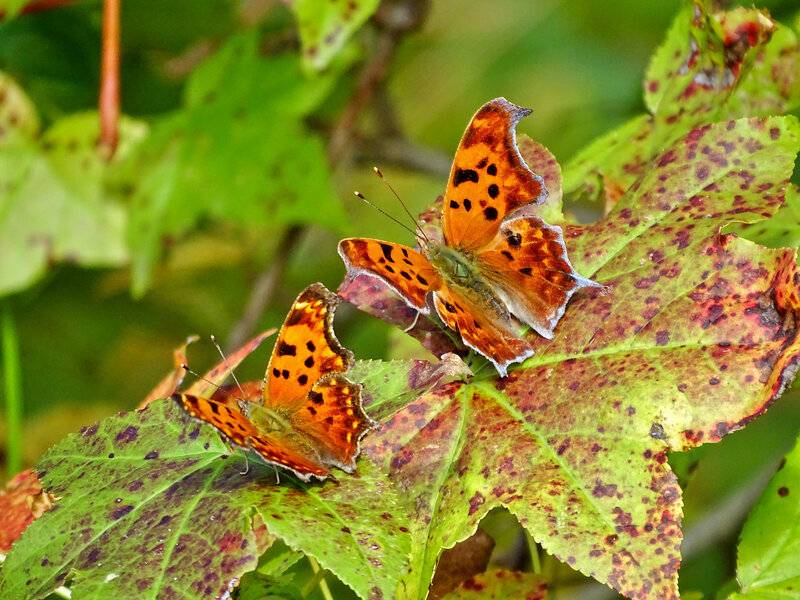 Photo of Comma and Question mark butterflies by Gary Myers. It’s time to sign up for the 36th Annual Manassas-Bull Run Christmas Bird Count! 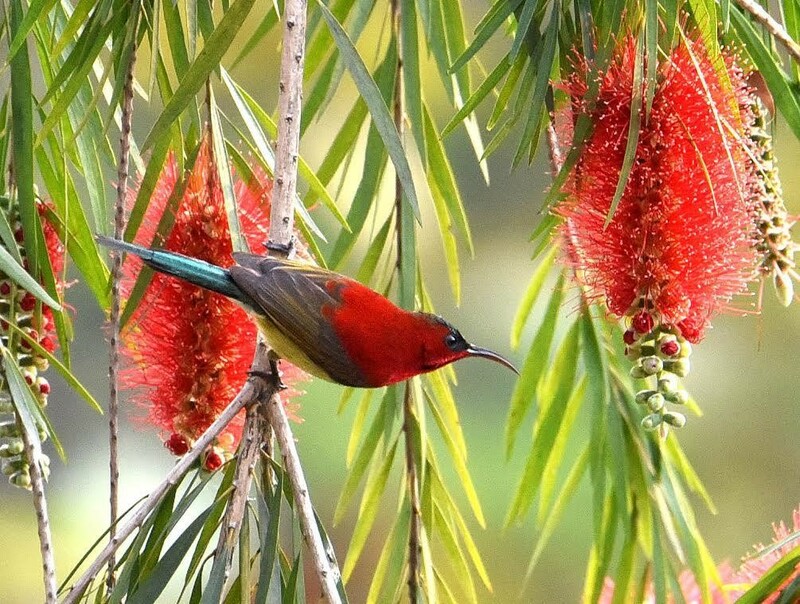 Birders of all skill levels are needed in the field and as feeder watchers. The count circle comprises Centreville and includes Manassas Battlefield, parts of Bull Run Regional Park, undeveloped areas south of Dulles Airport, as well as many stream valley parks and locations from Clifton to west of Fairfax City. A FREE hot lunch will be served to participants. If you haven’t heard from your sector leader or have any questions, contact Bob Shipman. Signing up is easy. Just click here. See you on the 17th! Bob Mumford became a fanatic birder after leaving the Navy and for about a dozen years chased rare birds all over North America. His North American list exceeds 765. He still travels widely and often, but is now content to capture the magic of wildlife and grandeur of landscapes in his photographic work. The event begins at 3 PM, but come at 2:30 for socializing and refreshments. It will be held at the National Wildlife Federation. Click here for a map and directions. Fairfax County Park Authority staffers have prepared a proposal to allow the flying of recreational drones in two more county parks, Lake Fairfax and Popes Head. Currently, this activity is allowed only in Poplar Ford Park. Audubon member Freya DeCola wrote an article with suggestions for advocacy actions, which you can read here. Fairfax County Chair Sharon Bulova invites everyone to her annual New Year Reception, January 10, 4:30 to 6:30 p.m., Fairfax County Government Center. Local governments manage local parks, waste, land use, schools, construction and development and more. Local government managers (for counties, they are called county executives) are now preparing the FY 2019 budgets that they will propose to the elected officials to whom they report. Arlington County invites residents to submit ideas and comments here. Check your local government for the schedule and ways to make suggestions. Join fellow conservationists on December 7, 7 to 9 p.m. and learn about renewable energy opportunities in Alexandria. Congressman Don Beyer will be the opening speaker. Perhaps some of what we learn can be used in other jurisdictions. Join us for the 118th annual Christmas Bird Count (36th for ASNV). We are looking for people to count in the Manassas Battlefield area, Bull Run, and Manassas City areas as well as around Centerville, south of Dulles Airport, and Chantilly. The quarry is a great place to find waterfowl in winter. 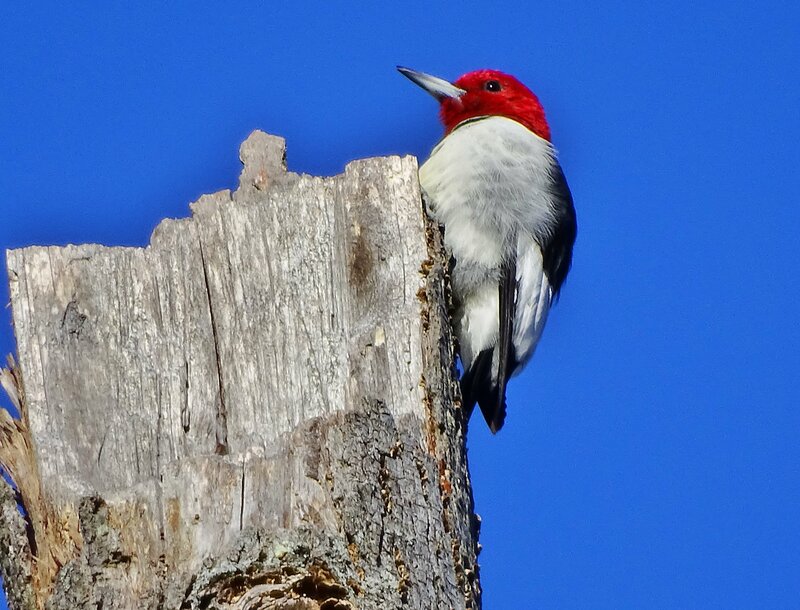 The woods and lake shore offer good habitat for other winter species, including resident red-headed woodpeckers. Toby Hardwick leads with Rick Purvis co-lead. Sponsored by ASNV. Getting there: Exit 40 (Route 15) from I-66, 24 miles west of I-495. Go south on Route 15 (toward Haymarket) for 0.3 miles to Route 55. Turn right on Route 55 and then after 0.9 miles turn right onto Antioch Road. At 1.3 miles turn right on Silver Lake Road to park entrance at 16198. Continue to end of park drive; meet at parking lot near the lake. One of our newer additions of places to bird. Join Lead Phil Silas and co-lead Jean Tatalias as we scout the lake and surrounding park trail. Sponsored by the Northern Virginia Bird Club.